Lifetime Coin Collection Online Auction — Harritt Group, Inc.
Cash, check* or wired funds. Credit card accepted with 3% convenience fee. Payment by check is subject to a 10 day business hold for verification of funds. Selling online to the highest bidder the outstanding lifetime collection of the late Robert Lentz of Floyds Knobs, Indiana. A remarkable coin collection, many of which are graded and uncirculated, includes two gold coins, over 240 Morgan silver dollars – many in sets, hundreds of silver halves, quarters and dimes, nickels, large and small cents, proof sets, commemorative coins, currency, trade coins, foreign and much more. 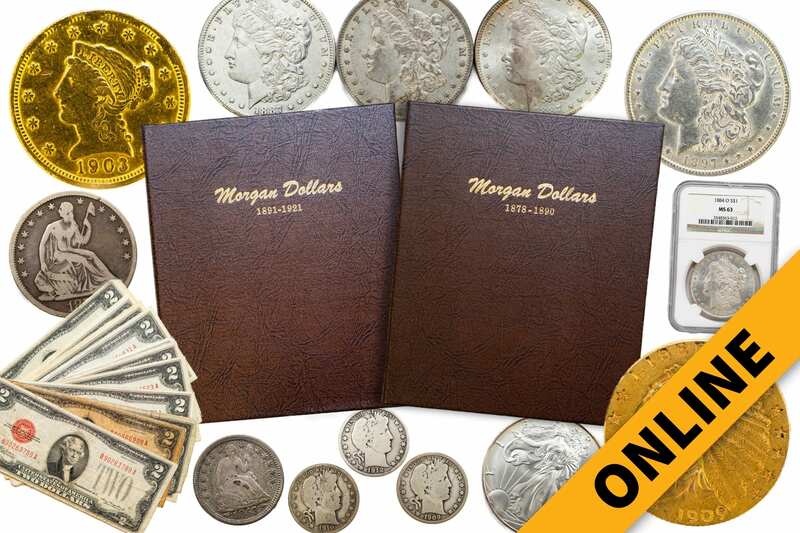 Ninety Four (94) Coin Set of Morgan Silver Dollars in albums 1878-1921 EXCEPT 1893-S & 1895. 1909 Gold $2.50 Indian Head Quarter Eagle Coin and 1903 Gold $2.50 Liberty Head Quarter Eagle Coin. 1896 Morgan Silver Dollar, 1897 Morgan Silver Dollar, 1900 Morgan Silver Dollar, Three (3) 1921 PDS Morgan Silver Dollars with case, 1894-S Morgan Silver Dollar in case, 1882-CC Morgan Silver Dollar in case and 1883-CC Morgan Silver Dollar in case. (4) Peace Silver Dollars including (2)1922-D and (2)1934-D, (3) Peace Silver Dollars including 1922, 1923 and 1924, (4) Peace Silver Dollars including 1923-S, 1924, 1925 and 1927. 1997 American Eagle Silver Dollar, (2) 1999 American Eagle Painted Silver Dollar in Box, 2002, 03, 13, 15 and 16 American Eagle Silver Dollar. (3) 1986 US Statue of Liberty 2-Coin Commemorative Proof Set and many more. 1974-S Eisenhower Silver Clad Dollar, (32) Eisenhower Dollars including (3)1971-D, (5)1972-D, 1974, (19) Bicentennial 1976, 1976-D, 1977 & (2)1977-D CN Clad and (12) Eisenhower Dollars 1971-1978-D.
(11)Susan B Anthony Dollars 1979-P – 1999-D, (31) Susan B. Anthony Dollars including (2)1979-P Far Date, 1979-P Near Date, (2)1979-D, (2)1979-S, 1979-S Proof Clear S, (2)1979-S Proof Filled S, (2)1980-P, (2)1980-D, (2)1980-S,(2)1980-S Proof, (2)1981-P, (2)1981-D, (2)1981-S, (2)1981-S Proof Filled S, (2)1999-P, (2)1999-D, 1999-P Proof in 2 Books and (6) Susan B. Anthony 1979-1980 Dollars in uncirculated condition in sealed package. (200) Washington Silver quarters, (61) Washington Silver Quarters, (4) Standing Liberty Silver Quarters including (2)1928, 1929 and 1930, 1897-O Barber Silver Quarter, (2) Barber Silver Quarters including 1895 & 1895-O, (5) Barber Silver Quarters including 1894-O, 1897, 1898-S, 1899, 1899-O, (16) Barber Silver Quarters including 1900, 1902, 1903, 1903-O, 1907, 1907-O, 1907-D, 1908-O, 1908, 1910, 1911, 1912, 1914-D, 1915-S, 1915 and 1916-D and (5) Silver Quarters including 1858 Seated Liberty No Motto & (4) Standing Liberty Including 1927, 1928-S, 1930-S & one unknown. (316) Pre-1965 Roosevelt Silver Dimes and (229) Mercury Silver Dimes. 1864 Two-Cent Large Motto Piece, 1807 Half Cent Draped Bust Type, (4) Bust Dimes including 1834 Large,1834 Small,1835 & 1836 Bust Dimes, (2) Silver Half Dimes including 1835 Capped Bust & 1857 Liberty Seated, 1853 Liberty Seated Silver Half Dime, (6) Liberty Seated Silver Half Dimes including (2)1838 No Drapery, 1845, 1852, 1853-O, 1854 Arrows, (7) Liberty Seated Silver Half Dimes including 1840, (2)1841, 1842, 1843, 1847 and 1848, (12) Liberty Seated Silver Half Dimes including (4)1853, 1854, (3)1856, 1857, (2)1858 and 1859, (9) Liberty Seated Silver Half Dimes including (2)1860, 1861, 1862, 1870, 1871,(2) 1872 and 1873, large selection of US Mint & proof sets, foreign coins and currency, collector coins & silver rounds. 1928 Twenty Dollar & 1934 Ten Dollar Federal Reserve Note, 1934 Five Dollar & One Dollar Silver Certificates, Two Dollar US Notes & Federal Reserve Notes and three Military Payment Certificates. One cent Kettle Island & Bonnie Blue Coal Scrip, Blue Motor Coach Lines & Johnson’s Battery trade tokens.